Yamaha has plugged the hole in its scooter range with the launch of the new Xmax 250 scooter. 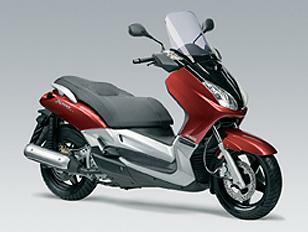 The new 4-stroke scooter is designed to take the style of the successful Tmax 500cc auto and make it available to a wider market with better handling round town but still enough power to keep ahead of the traffic. The Xmax comes with a 12.5 litre tank and Yamaha promise some pretty good economy from the liquid cooled 250cc engine so the range should be good. A 15-inch front wheel and 267mm front disk should help on the handling front while a wide fairing and fancy dash should keep the rider out of the worst of the elements. The Xmax will have massive amounts of storage as well with room for two full face lids under the seat and a cubby hole big enough for a full set of waterproofs in the front fairing. You can also choose a colour matched top box as an option. Yamaha hope to have the Xmax in dealers by early July but still haven’t finalised a price.